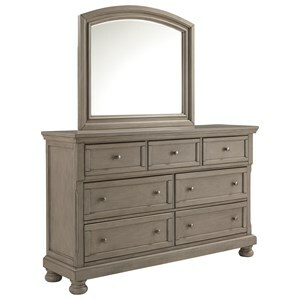 Add some essential bedroom storage space and cottage style with this clean dresser and mirror combo. Both pieces are bathed in a slightly weathered European cottage finish that pairs beautifully with the charcoal grey of the case top. As storage goes, the seven drawers and two doors with space within provide plenty of room for your clothing and accessories. The Carriage House 7 Drawer Dresser and Mirror Combo in European Cottage Finish by Sunny Designs at John V Schultz Furniture in the Erie, Meadville, Pittsburgh, Warren, Pennsylvania area. Product availability may vary. Contact us for the most current availability on this product. The Carriage House collection is a great option if you are looking for Casual Cottage furniture in the Erie, Meadville, Pittsburgh, Warren, Pennsylvania area. Browse other items in the Carriage House collection from John V Schultz Furniture in the Erie, Meadville, Pittsburgh, Warren, Pennsylvania area.